Thank you. 1)After my husband bring all stuffs to the new home, can I come help him to unpack and arrange stuffs? 2) is it ok for my husband to arrange chairs and table when I'm not in the house? 1. Frankly this has nothing to do with Feng Shui. 1.1 There are so many Chinese dialect groups with such a diverse range of individual or even perculiar practices. 1.2 More important, you have to check with your husband's matriach or mother. As often, such things are governed by the mother. 1.3 Thus if your husband's mother gives you blessing to do so.. then go ahead. 1.4 If you ask, even if I said okay, can easily be overruled by the matriach or hubby mother. 2. Why not. He is not pregnant or anything like that. More importantly the taboo is the master bedroom. Where once the new bed is set into the new master bedroom. This bed must not be moved = no matter what. 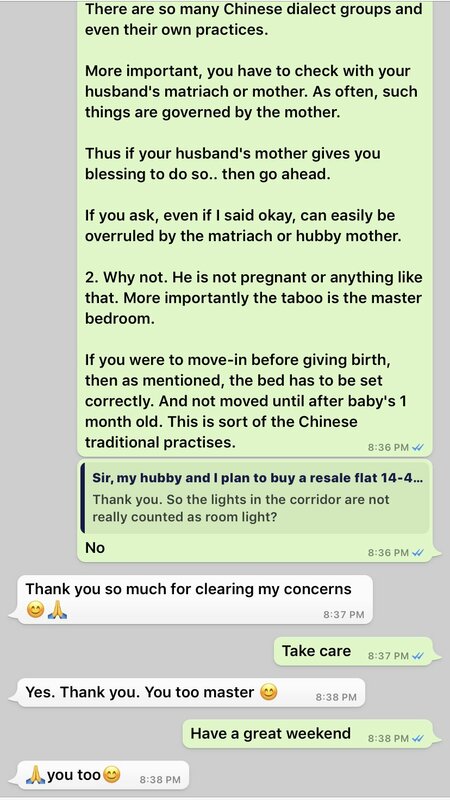 2.1 If the existing "bed of conception" has to be moved into the new house, the pregnant wife should not enter that bedroom anymore (often) until after giving birth or some are more strict.. until the entire 1 moth after baby is born. 2.2 If you were to move-in before giving birth, then as mentioned, the bed has to be set correctly. And not moved until after baby's 1 month old. This is sort of the Chinese traditional practises. Some additional information has been added to the above for clarity. Thus more details than the actual WhatsApp capture.